Princess Anne and Zara Phillips attended the Cheltenham Festival for the third consective day yesterday to take in the Gold Cup races. 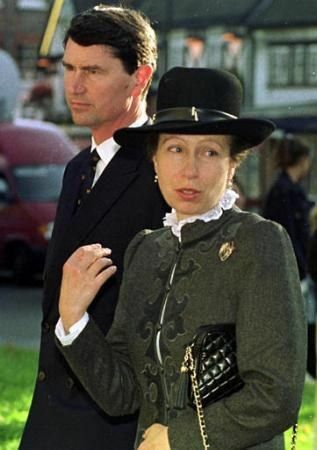 Princess Anne repeated a hat we have not seen on her for at least a decade- a black Homberg style hat with a studded band around the crown and slightly upturned brim on one side. One of our eagle eyed readers spotted this hat on Princess Anne back in 1969. That makes it at least 45 years old and cements Princess Anne as THE most enthusiastic royal fashion recycler. Hat recycling aside, I think this piece doesn’t translate well to current day and would have been best left back in the 1970s. Previously Worn: This event and this event in 1969. Thankfully, Zara’s hat was more successful. She looked lovely in a dove grey “elegant velour felt circular dish with delicate hand dyed lace detailing”. While I prefer Zara in more saturated colours, the shape and detailing of this hat is exquisite. This entry was posted in Great Britain and tagged Princess Anne, Zara Tindall. Bookmark the permalink. I like Zara’s hat. Princess Anne needs to burn hers. What an excellent find! If you look closely at this hat, the shape of the brim is the same and you can see the gold studs on the band around the crown. This is absolutely the same hat. This means we have a new record for Princess Anne- this hat is at least 45 years old. Wowza. I like Zara’s hat but it looks like it is resting on her sunglasses. This hat is much more attractive and flattering when worn without the glasses. Anne’s hat also made me think Canadian Mountie lol! I prefer Zara’s hat in the colour that Sophie chose. Well, why wouldn’t the crown of Princess Anne’s had have been crushed in storage over the past decade or two? She probably doesn’t have the storage facilities of her mother. Despite the “Only you can prevent forest fires” look, I think this hat actually isn’t so bad as some recent ones. Zara’s hat actually is attractive and goes nicely with her scarf. I think the brim was always shaped this way but it looks off to me. Anne looks like a Mountie to me too, but I do love her, no matter what. She has the ‘take me as I am’ attitude that I love and she can wear 20 year old clothing and still fit into it! I’m green with envy! Zara looks lively and fun, and her hat fits her. I wish it were a bit brighter color to compliment her fabulous smile but I do really wish her sleeves weren’t so tight, I think she must have a sweater on under her coat. Thank you, as always, Dear Hat Queen for sharing these grand hats with us! First glance I liked the homburg hat…but after reading your comment I noticed that it did make her head look long. Again, I love the coats these ladies wear. The scarf with Zara’s hat is a perfect match! Is this not the same hat Sophie Wessex wore in cornflower blue to Ascot last year? This is indeed, the same hat Sophie wore last year in electric blue. Good catch. I might not have noticed the shape was the same, since Sophie’s hat is straw and Zara’s felt. I agree with you about Zara’s outfit….the hat was lovely. The coat coat looked as though it had been wadded up in the back of a pickup – oh, make that Range Rover – for a while, and besides a pressing, could have done without the belt, since Zara is still carrying much of her baby weight. I have liked all of her hats this week, but perhaps something with more brim might balance out a wider bottom.